Online gambling companies launch and promote numerous tournaments every year but only few prove to be an instant success and hit with players. When Amercias Cardroom hosted The Cage on the 8th of October, they were surprised with the response and the reviews the tournament got from players and observers in the industry. The first edition of The Cage had a prize pool of $330,000 and participants included a number of well known poker players on the circuit. Amercias Cardroom has been a part of the Winning Poker Network since 2011 and has built a reputation for being a trusted and respected online gambling provider. The company announced that it was going to launch a second edition of The Cage on the 12th of November and will be even bigger than the first edition. Players who want to register for the second edition of The Cage will have to pay $5,000+100 for a direct buy-in or can opt to quality via the numerous satellites that are currently taking place, where the buy-in is only $1.65. The second edition of The Cage will last for only four hours and will go live at 8 pm Eastern Time. The Cage operates on a time-based format and will feature a six max table cash game that is broken down into three levels. Each level runs for 80 minutes and will be open to increasing antes and blinds. Players who qualify or buy-in will start the tournament with a total of 5000 chips and at the end of the tournament, players will be able to convert their remaining chips into hard cash . 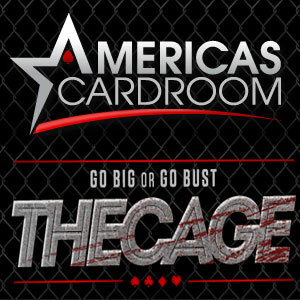 In a statement, Michael Harris, who is a representative for Americas Cardroom said "The Cage represents a unique opportunity to show your skills as a poker warrior and fight like a champion. This is the place to be if you want unadulterated poker excitement. The first Cage tournament was so popular that our members asked for it again, and we were more than happy to oblige. We are expecting more players, a bigger prize pool and another incredible poker battle." On the 26th of November, Amercias Cardroom will run The Cage PLO at 8 pm Eastern time and on 14th December will host for the first time ever be running a guaranteed $1 million in Winning Millions. This will be the first time in nearly four years since a million-dollar tournament will be held on a Sunday in the U.S. If you are interested in the action at Americas Cardroom, be sure to sign up with 27% Rakeback.